In Canada, more than 200,000 people are homeless every year. They are dependent upon emergency shelters and emergency and crisis services for health care and mental health treatment. But what if there was a better way? A way to eliminate homelessness immediately and help those most vulnerable in our communities gain the support and resources needed to live a dignified life? 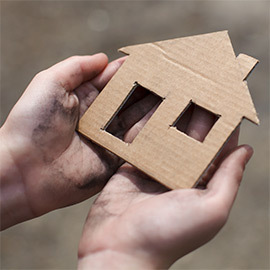 Wilfrid Laurier University Professor Geoffrey Nelson has addressed the issue of mental health and homelessness through a ‘housing first’ approach based on the premise that people who have housing are in a much better position to benefit from mental health and other support services. Nelson has studied mental health and homelessness throughout his entire career. He arrived at Laurier in 1979 teaching in the Community Psychology program, and has seen how much the approach to mental health and homelessness has changed since the 60s and 70s. Nelson’s passion for mental health support and awareness is largely a personal one, but he says the issues of homelessness and mental health are significant for all Canadians to help solve. Recently, Nelson served as the national investigator for qualitative research on the sustainability of the At Home/Chez Soi research project, a 2008 project funded by the federal government and led by the Mental Health Commission of Canada (MHCC) to assess the viability of a Housing First approach to homelessness. The Housing First program sees participants offered housing immediately through rent supplements and supported through ongoing case management support services. The program is innovative in that it provides an alternative to emergency shelters and forms of housing that come with “strings attached,” like sobriety or medication compliance. The study looked at 2,000 people in five cities for two years; overall, the results were overwhelmingly positive. Over 60 per cent of the participants of the Housing First program remained in housing within the last six months of the study, whereas only 31 per cent of participants in current programs were housed all the time. Through Nelson’s research, he collected personal stories from the project’s participants and received a grant to take the program into other communities to discover how the program might be implemented throughout Canada. Even though the program has many benefits, Nelson says the approach has its limitations.